How Does the Work of School Libraries Impact Your Work as a Library Professional or Person? I am just coming out of nearly 7 years working for Brooklyn Public Library. It was important, hard work. There was a great deal of demand from the public and not nearly enough library staff and budget to meet everyone’s needs. Some of our most demanding patrons were public and charter school teachers. Before August was even over, the phone in Brooklyn Public Library’s Youth Wing was ringing off the hook. We’d take turns answering. “I just took the last two calls, you take the next one,” we’d say. You see, these calls were from teachers calling to schedule class visits to the library. Because many NYC public schools don’t have a dedicated library or librarian, they counted on us to fill this void. They needed tours and storytimes and introductions to the library and booktalks and research help and computer access and more. By mid-September, we were booked through the end of January. Their need was so great, and yet, there were so few of us public librarians to lend a hand. “When can we come back?” teachers would ask at the end of their visit. We’d schedule another trip for the same class maybe four months in the future. If a single class could visit us twice a year, we’d say they lucked out. Now, I’m a school librarian in an independent (read: private) school. For 400+ students, we have two librarians, 18,000 books, and a beautiful library that is opens before school starts and closes after the school day ends. The other librarian and I do all the same things I used to do for students in the public library, except our patrons don’t have to jockey for our attention. We are there for the sole purpose of serving this particular population. The school’s parents tell me they chose this school specifically after seeing the library and learning that their children would make regular library visits. 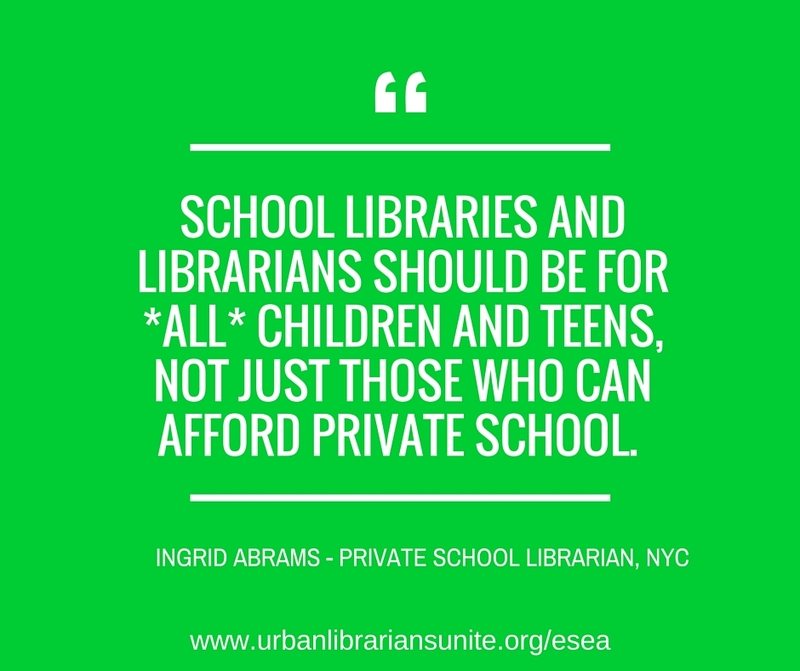 School libraries and librarians should be for *all* children and teens, not just those who can afford private school. NYC children shouldn’t have to settle for one or two visits to the public library every year. Going to the library should be part of everyday life for every single child. Strong readers and researchers make for successful students and human beings, and school library access fosters this. For the first time we are seeing strong language protecting School Libraries in national education policy. ESEA is up for a vote and this bill will be CRUCIAL to the future of school libraries, a section of the profession that has been under assault for decades. An Assault on One is an Assault on ALL. Stand up for School Libraries in America TODAY! Contact your Representative to let them know how essential this bill is to our children’s education and futures. Contact absolutely everyone you know and ask them to do the same thing. Vote Yes on the Every Student Succeeds Act Conference Report. School libraries are critical to our children’s future and the Conference Report includes critical language to support effective school library programs. This language is historic: For the first time in half a century Congress has underscored the importance of effective school library programs by expressly including them in multiple parts of this watershed reauthorization of the Elementary and Secondary Education Act. Join the movement to protect school libraries and call Congress today. ‹ Sarah Houghton Supports School Libraries and wants you to contact Congress!